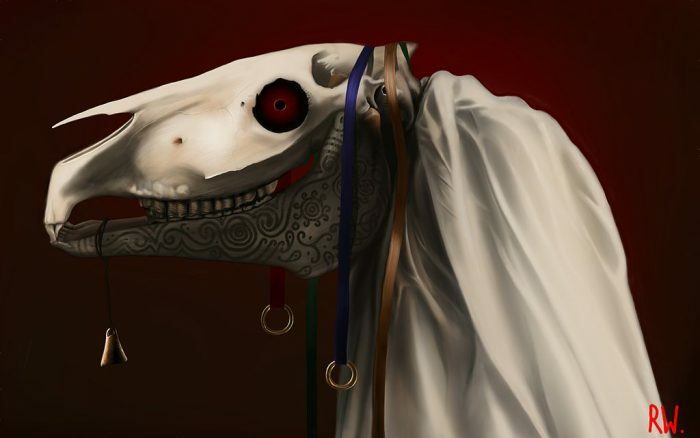 The Mari Lwyd is a wassailingfolk custom found in South Wales. The tradition entails the use of an eponymous hobby horse which is made from a horse’s skull mounted on a pole and carried by an individual hidden under a sackcloth. It represents a regional variation of a “hooded animal” tradition that appears in various forms throughout Britain. Merseyside Mummers, The Jones Ale Soul-Cakers, feature a Mari Lwyd in their Midwinter mumming plays. The Hookland variant of the Mari Lwyd is simply known as The Bone Horse.